"Great To Use For Winter Wedding Dresses"
Long sleeved wedding dresses can be worn year round. But if you have a wedding that will take place during the cold winter months, a wedding gown with long sleeves is a good choice for winter wedding dresses. You can have sleeves that are all the way to the wrist, elbow or three-quarter length sleeves. 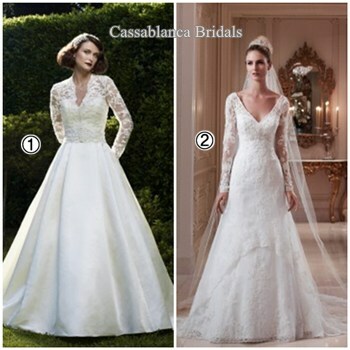 Below are two wedding dresses designed by Cassablanca Bridals. Dress (1) has actually a removable jacket over a strapless bodice. Dress (2) is a beautiful lace wedding gown with a satin under dress. But the long sleeves are of lace only. The dress below is a gown by DaVinci Bridals. The removable jacket has a train attached. There is a strapless under dress with train. Below is a beautiful gown by Alfred Sung. Check out this gorgeous lace wedding gown by Maggie Sottero. 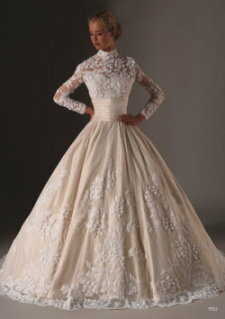 Perfect wedding dress for a second time bride or mature bride who doesn't want a long train. Both bridal gowns below are Justin Alexander designs. The one on the left is a classic ball gown long sleeved wedding dress. The one on the right has three quarter length sleeves. They are examples of timeless styling. Here's a wedding dress with long sleeves from Bonny Bridals Plus size collection. 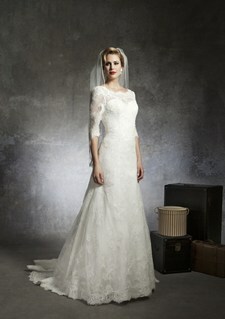 As you can see long-sleeved wedding dresses are no less glamorous than sleeveless and strapless designs. You can order them in any size range. Notice how sheer fabric sleeves or unlined lace sleeves gives a softness to the overall look. Long sleeves that aren't tight fitting look best on those who have heavy upper arms. Want to look for more long sleeve bridal dresses? Take a look at our affiliate BestBridalPrices.com to find the dresses above and other long sleeved wedding gowns. Read these tips on how to pick the right sleeve length for your body type when considering wedding dresses with sleeves. If you need a modest wedding dress then check out this information.